After hitting a bit of a knitter's block for a couple of weeks, I've finally rediscovered my knitting mojo and have managed to finish another pair of socks! This pair is for Dan and I think was bribery for doing something, but it's been almost six weeks now and I can't recall what I was trying to bribe him in to. Regardless, he gets socks! Even if I hadn't run out of knitting steam just over half way through these, this pair would have taken a little bit longer than my norm because I had to reknit the toes. I'm still searching for the knitting merit badge that I believe this deserves. Speaking of knitting accomplishments, I noticed that the repeating pattern would make it fairly easy for me to figure out how many stitches are in these socks. So I figured it out. Each toe and heel had about 1,248 stitches and each block section was 720 stitches each... so short row toes (not including the first ones I had to frog), short row heels, plus 21 block sections... that's about 17,616 stitches per sock or 35,232 stitches total. Over 35,000 stitches. Okay, maybe I never need to calculate that again. I have only a tiny amount of time before 2014 is over and honestly, I'd really like to make it to thirty pairs of socks. 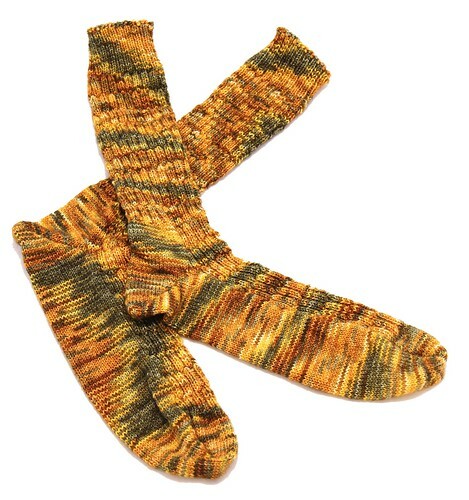 I see some worsted weight footies in my future.